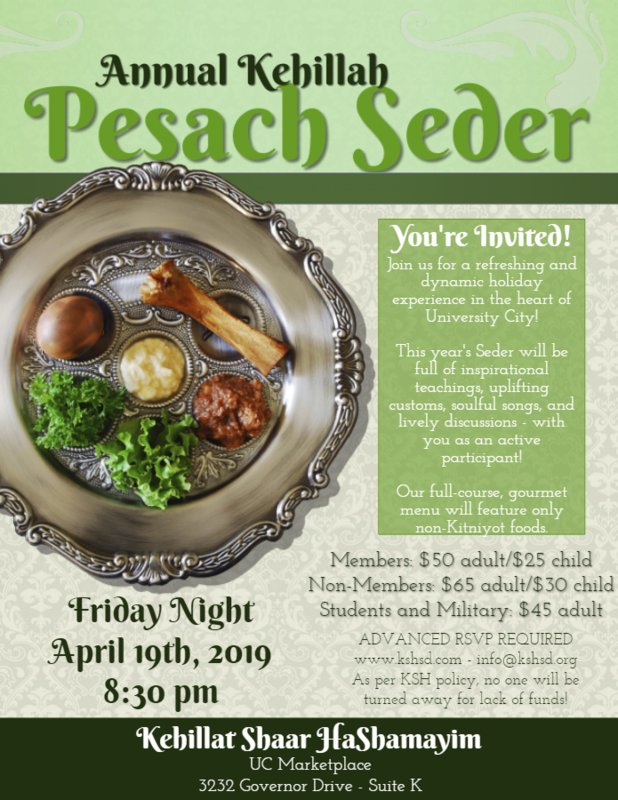 You are invited to join us for a dynamic and refreshing Pesach Seder with San Diego's newest spiritual community! This year's Seder will be full of inspirational teachings, uplifting customs, soulful songs, and lively discussions - with you as an active participant! Our full-course, gourmet menu will feature only non-Kitniyot foods. Gold and Platinum Members receive (2) complimentary tickets to this event. NOTE: The KSH Seder is meant to be an uplifting and transformational spiritual experience, not merely a communal dinner. As per Kehillat Shaar HaShamayim's policy, no one will be turned away for lack of funds! Please contact Rabbi Yonatan privately if you would like to join us and require assistance. When registering, kindly consider sponsoring a reservation for someone else by leaving us a note in the proper field. Rabbi Yonatan Halevy can be reached by phone or text at (858) 752-1025. If unavailable, please leave a message and your call will be returned shortly. Kehillat Shaar HaShamayim is a division of Shiviti, a non-profit organization.